Cambridgeshire’s biggest charity event, Chariots of Fire, saw 340 local businesses enter teams to take part in the 1.6 mile relay race, raising an amazing £63,140 for Alzheimer’s Research UK. 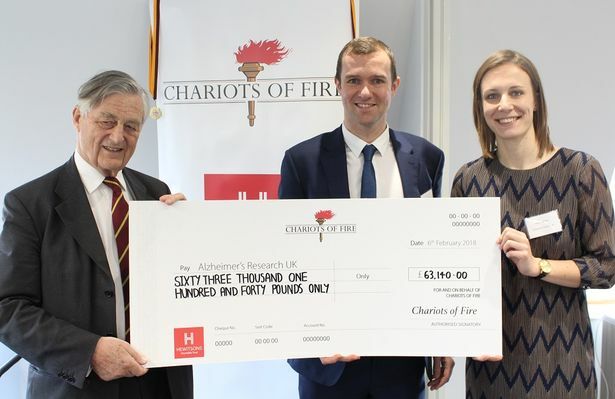 Hewitsons Charitable Trust, which organises the Chariots of Fire race every year, handed a giant cheque for the total sum to the Alzheimer’s Research UK on Tuesday 6th February. During the presentation, special thanks was given to ‘The Great Dames’, represented by Dame Carol Black. The Team, captained by Dame Mary Archer, raised an impressive £7,000. All of the money donated will go to Alzheimer’s Research UK helping to fund its research efforts into the link between Down’s Syndrome and Dementia. The project is using state-of-the-art brain imaging technology at the Cambridge Biomedical Campus to explore why more than 50% of those living with Down’s syndrome in the UK go on to develop Alzheimer’s in their 50s.